The Coast Guard plans to expand spring ice breaking operations, entering the bay of Green Bay, Monday. During the ensuing days, icebreaking operations will involve fracturing ice and track preparations to the port cities of Escanaba, Marinette-Menominee and Green Bay. Ice breaking and track work will also occur west of the Sturgeon Bay Ship Canal. The timing, schedule and locations of operations will depend of weather and wind conditions. Ice breaking operations may take several days to complete. Commercial carriers are expected to begin transiting the bay of Green Bay on or about April 3rd. The Coast Guard recommends members of the public who recreate on the ice, particularly those who fish, or operate snowmobiles or all – terrain vehicles on Sturgeon Bay or the bay of Green Bay, to plan their activities carefully, use caution on the ice, and stay away from shipping channels. 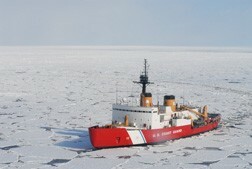 Ice breaking activity can weaken ice far beyond the tracks created by the icebreakers. It is also recommended users stay tuned to local media resources for the status of regional waterway closures and future planned ice breaking operations, and follow media notification and social media outlets @USCGGreatLakes on Twitter, and Brown County Sheriff’s Office’s Facebook page. For more information, contact Coast Guard Sector Lake Michigan at 414-747-7190.